Gas Caddies | Easy to Move. Easy to Use! Easy to Move. Easy to Use! 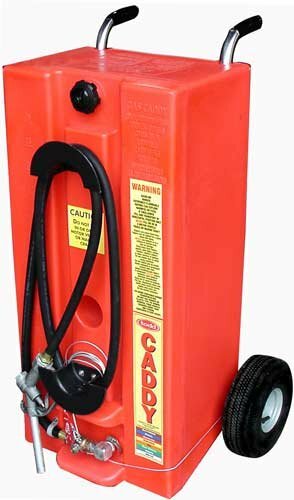 Gas Caddies are an economical solution for on-site fuel storage and fueling. This unit boasts a capacity of 28 gallons and ease of mobility. Designed with a 10 foot hose and molded hose brackets, neat and orderly storage is a cinch! The pneumatic tires offer smooth and reliable transport across a variety of surfaces. This caddy meets current U.S. Coast Guard, U.N., and DOT Standards, when used according to fuel transportation guidelines, to keep you in compliance with your fuel transport needs. All caddies are labeled with UN Marking, “UN3H1W”. The molded-in baffle adds support and strength to the caddy, offering years of reliable service. There is an optional pump kit available to transfer fuel easily, above the height of the caddy. 22 1/2" x 27 1/2" x 41"